Three women were arrested today after assaulting their waitress with a water glass. They also chucked a dessert book at her face. Paramedics treated a server at a Red Lobster in Fairview Heights on Friday after a customer threw a water glass at her head. 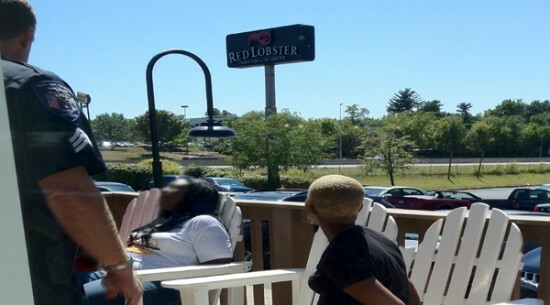 It happened at the Red Lobster in the 110 block of Ludwig Drive around 2 p.m.
A witness said she saw three female customers get mad because the server was filling up their glasses with water too often. According to the witness, as the server walked away one of them picked up a water glass and threw it, hitting the victim in the back of the head. The witness said as the server turned around, the customer hit her in the face with one of the dessert books. The server was treated by a paramedic, but did not go to the hospital and stayed at work. Customers and restaurant employees made sure the women stayed put until police arrived. Officers then arrested the three suspects. Police took the suspects into custody and said they were still trying to sort things out before deciding what charged will be filed. The incident comes just six months after a cell phone video captured four female customers beating up a server at the same restaurant over what they deemed bad service.